Mind precedes all mental states. Mind is their chief; they are all mind-wrought. If with a pure mind a person speaks or acts happiness follows him like his never-departing shadow. You may notice, though, that here “mind” (which in Pali is manas — a word that includes thought) is only one factor affecting our happiness, with speech and actions being another two. Body, speech, and mind are seen, in Buddhism, as three ways in which we can either produce suffering for ourselves, or free ourselves from suffering. Mind is, however, seen as primary. Our speech and actions don’t arise without cause, but rather spring from the mind — not necessarily from what we think of as thought — but certainly from the mind. So there’s nothing outrageously un-Buddhist about this quote. But despite this similarity, this quote doesn’t comes from a Buddhist source. The form of this quote comes from American author, salesman, and motivational speaker, Hilary Hinton “Zig” Ziglar, born 6 November 1926. And this seems to be to be rather different from Ziglar’s quote, and perhaps even more closely aligned to the Buddha’s teaching. It’s still not the Buddha’s words, though, and so this is most certainly a Fake Buddha Quote. I appreciate your effort into this matter. 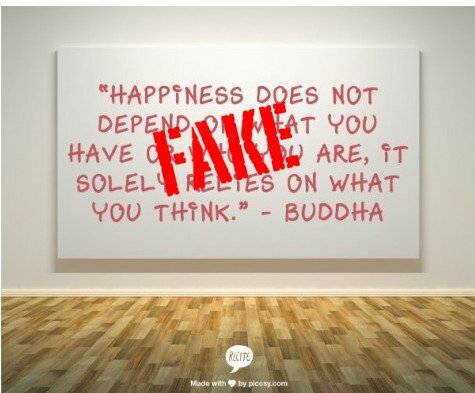 A friend of mine is in Dharamshala, India – the hub of Buddhism in India, and he sent me this quote painted on a wall wondering whether it is of Buddha at all or not. We had a feeling that Buddha couldn’t have said this, and just then we found this page. Thanks for the clarification. May God save Buddha from these fake gurus. I personally think that their is a difference between these quotes and the teachings of buddha. These quotes seem to indicate you should make the mind be happy all the time. Buddha teaches to watch the mind, let it say bad things and see that it is not who you are.